At BNSF, we believe it is good business and good citizenship to minimize our impact on the planet and to contribute to the long-term sustainability of every community we serve. Railroads are by far the most environmentally preferred mode of surface transportation, and BNSF is a leader in the rail industry for the protection of our air, land and water. Rail also provides a tremendous opportunity beyond fuel efficiency and sustainability: it reduces supply chain costs, allowing American businesses to be more competitive in the global market. 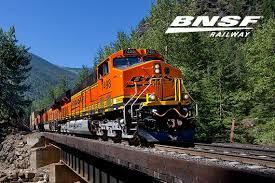 A BNSF train can move one ton of freight 500 miles on just one gallon of diesel fuel.